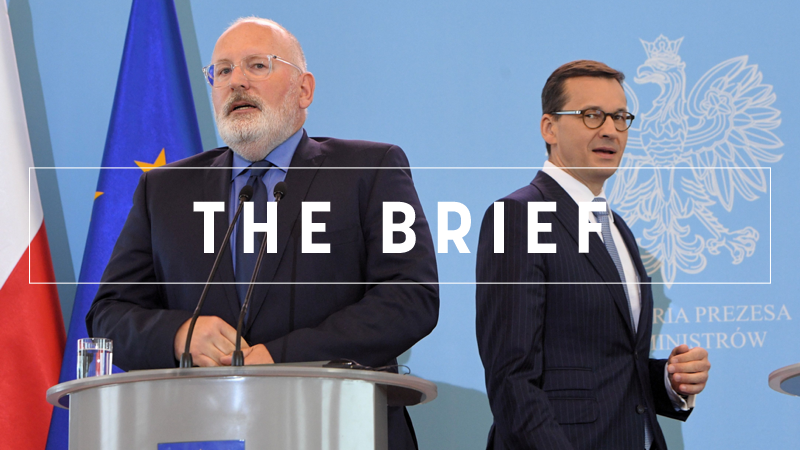 The Brief – Breakthrough with Poland: Wanted or not? Yet another visit by Commission Vice-President Frans Timmermans to the Polish capital resulted in no breakthrough in the spat between Brussels and Warsaw over the rule of law. Tensions have been escalating for a year and the affair seems to have reached a standoff, with neither side quite sure how to proceed. The Polish government has made clear it thinks it has done enough to address the Commission’s concerns but Brussels is far from convinced. While the Commission thinks some of the recent proposed changes – such as equalising the retirement age for men and women and the appointment of court assessors – are satisfactory, it still feels the more contentious issues remain unresolved. One of them is a disputed Act on the Supreme Court about to take effect on 3 July. Although both sides emphasised the need to continue a dialogue, fronts seem to have hardened in the recent weeks. The fact that the press conference at the end of the visit lasted 10 minutes – and no questions were allowed – speaks volumes. “There are forces that do not want a compromise; I am glad that the Commission vice-president does not belong to these forces,” said Polish Prime Minister Mateusz Morawiecki in a side jab against his guest in Warsaw, after last week saw internal divergences inside the Commission itself on how to deal with the rule of law dispute. The meeting came shortly after the Commission asked for a formal hearing on Poland at the General Affairs Council on 26 June, which would take the Article 7 procedure a step further. Despite calls from MEPs and former Polish leaders demanding the Commission, the guardian of the treaties, take swift action and open another infringement procedure, separate from Article 7, against Poland concerning this law, it is unlikely to happen. Nor is Article 7 likely to produce tangible results. The reason is simple: the EU has never used Article 7 before and no one seems entirely sure how to handle the whole process. “The Article 7 procedure is an ecosystem, it is in progress, and we will not anticipate other procedures,” Commission spokesman Margaritis Schinas said last week. Depending on the course of the hearing on June 26, EU ministers will have decided on further steps on the rule of law procedure. Ultimately, it could lead to Poland losing its voting rights in the European Council, if the other 27 member states would agree unanimously – which is again unlikely, as Hungary already expressed its intention to shield Warsaw from harm, probably in the hope of receiving the same support when needed. Other countries are also less than willing to go along with the Berlaymont. If Brussels decides to go the extra mile to avoid a reverse veto, a move here could be to put both cases together to vote. But make no mistake: no matter what shape the 26 June decision will take, it comes at a crunch time for the EU. Migration, eurozone reforms and defence dominate the agenda of the European Council meeting only days after, while the window of opportunity for broad European reforms ahead of next year’s elections is shrinking. The Poland dispute is not on the official agenda on the Council, but could still be added last minute. For Brussels, it’s a choice between action and deadlock. And it seems that EU leaders do not want to pick up another quarrel and put really crucial decisions in jeopardy, counting on minimal concessions from the Polish side to let things slide, for now. The Greece-Macedonia name dispute looks a little bit more robust after the countries’ leaders signed off on a preliminary agreement. Alexis Tsipras still refuses to wear a tie though. As expected, European nations are not on track to meet their Paris Agreement targets and an “unambitious” renewable energy target brokered last week will hardly help things. France and Germany will hope to confirm how much room for eurozone reform actually exists, during a bilateral summit tomorrow. The single currency area’s fiscal sheriff (yee-haw) warned that a planned Commission investment protection fund isn’t going to be enough. The Macron-Merkel meet-up might be overshadowed by migration matters though. Aquarius finally docked in Spain, here’s a great cartoon on the whole debacle. Day two of the 9th Petersberg Climate Dialogue in Berlin featuring German Chancellor Angela Merkel and Polish Prime Minister Mateusz Morawiecki. Perennial favourites Argentina, Brazil and Germany have all struggled so far, so will Belgium flatter to deceive against tiny Panama? Check out this fantastic read from Diables Rouges star Romelu Lukaku.